A map, for DOOM, that I´ve made in a few hours, from scratch. 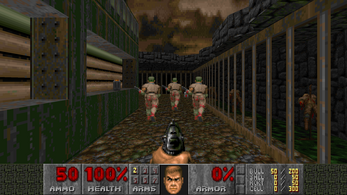 It works with Doom2.wad, it is fully compatible with all your favorite mods, and engines. It´s based on a fast paced experience, with no moments to rest... just in pieces. Some tricky secrets, and intense situations. Count every bullet as essential. Well, finally, it uses the original Doom 2 texture set, so, you´re not gonna have any problem with it. Throw me a review, it will be truly appreciated. - Take it to your main Doom directory, where you can run an engine, such as ZDoom. - Paste it, and drag the file to your launcher. - Now, you´re ready to start. - Fully compatible with all your favorite mods, and engines. - Remember, the map works with Doom2.wad.